Lots of us are buying local these days, purchasing food from nearby farms and shopping in town rather than heading out to the mall. There seems to be a gut-level sense that buying from local businesses is the right thing to do, helping us eat healthier and perhaps even keep local businesses going during this fragile economy. But exactly what are we accomplishing with this form of localism? 1. Eating well. If you’ve ever wondered why your spaghetti and meatballs (or some other favorite dish) doesn’t taste as good as it once did, switching to locally raised beef (or other local ingredients) can be an eye opener. Whether or not buying local food will reduce your carbon footprint (see below), it will almost certainly provide the enjoyment of fresher, tastier meals. In addition to reducing the impact of travel time on freshness, buying local encourages us to eat seasonally and enjoy a diverse range of foods from farms committed to “polyculture.” Some would argue that buying local food also reinforces food security by reducing dependence on a larger national food system that can become vulnerable to factors such as crop disease, extreme weather and food poisoning outbreaks. 2. 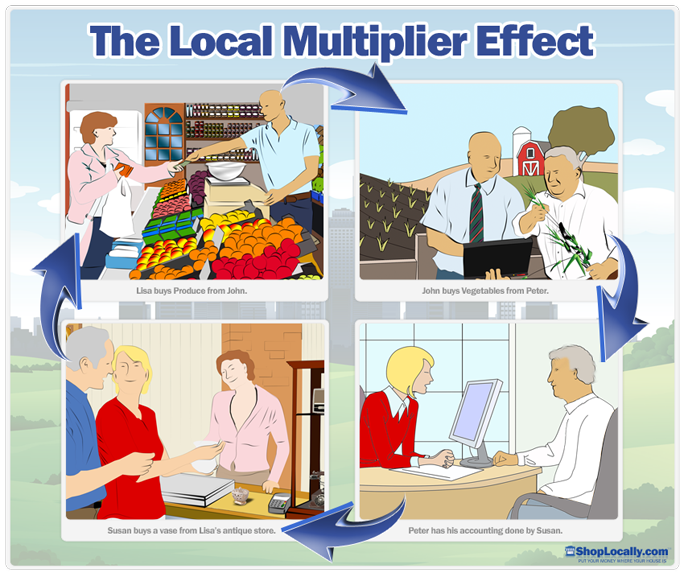 Triggering the local multiplier effect. This is an economic concept that basically means a dollar spent at a locally owned business will circulate in the community many more times than a dollar spent at a non-local business. One estimate is that $100 spent at a local business generates $45 dollars in the community, while spending the same amount at a national chain yields just $15. Why the difference? Local businesses are more likely to spend their money (the dollars they earn from your purchase) at other local businesses, including banks, accounting firms, newspapers (that run their ads), marketing firms, doctors and companies that supply their goods, raw materials or equipment. All of this can be good for the local job market. Add in the benefit of taxes local businesses pay to municipal and state governments and you get funding for our teachers, police and firefighters as well as for the lightbulbs at City Hall. 3. Putting your money where your mouth is. If you’ve ever complained about the number of vacancies in your downtown, the disappearance of charming mom-and-pop stores, often replaced by national chains, or the difficulty of buying a particular item without taking a time-consuming trip to the mall, consider the impact you can have by buying local. As alluded to in 1 & 2 above, buying from local businesses can make a meaningful difference in helping them survive and even thrive during these difficult times. 4. Saving energy. Perhaps you’re trying to reduce your carbon footprint — the amount of energy represented by your consumer and lifestyle choices. Buying locally produced food or other goods reduces the carbon emissions associated with transporting those items. Some argue that this doesn’t necessarily translate into a lower carbon footprint because there are other factors to consider, such as the amount of energy used to produce something regardless of where it is produced and the energy consumed in refrigerating or cooking food. I’ve never quite mastered the art of calculating my own carbon footprint. But the goal of doing so leads me to turn off lights and adjust the thermostat. When it comes to buying local, it’s easy to appreciate that heading into town takes less gas than driving to the nearest shopping center. The green I save tells me I’m on the right track. 5. Building community. There’s something more satisfying about buying an item or ordering food from someone who treats you like part of the extended family — or at least like a truly valued customer. Choosing locally owned stores, restaurants, banks and professional service providers can put the human dimension back into the most ordinary (and otherwise sterile) day-to-day tasks. Ideally, it also can foster a sense of interdependence, encouraging people to work together to benefit the whole community.